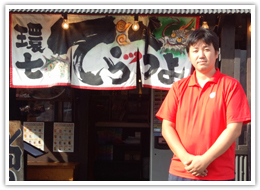 Ramen-loving CEO Mr. Kazuhiro Terada owns and runs ramen shops in Abiko city and Mito city. 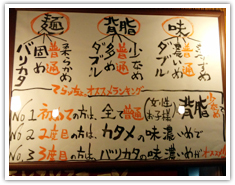 Since "Kannana" is a nickname for a highway, people may wonder why a restaurant in Abiko (unrelated to the highway) might be named "Kannana Ramen." This store has a history of apprenticeship with a famous ramen shop by Kannana called "Tosakko Ramen"; the name is symbolic of this tutelage. 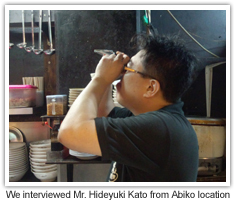 Mr. Terada began using Brix meters once he started to manage multiple locations. 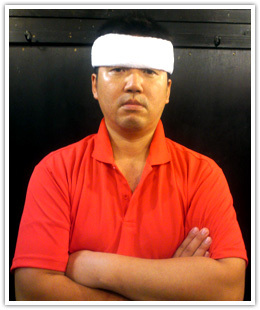 We first met Mr. Terada when he contacted us saying that "the readings on the demo unit are inconsistent." 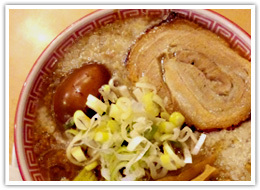 "Teraccho" ramen is characterized by their extra-thick broth made with plenty of pork backfat. The "extra-thickness" of their signature broth became a problem when trying to use it on a refractometer; sample was so murky that it didn't generate a clear reading. Because Brix meters are based on light refraction, extra-thick broth would only show fuzzy boundary lines, resulting in instable readings. Mr. Terada demoed several different models to no avail, but he did not give up. When he asked us if we had any other models that might work, we suggested "Rice Moisture Checker G-50," granted that we've never tried this model for such application. This unit is typically used to measure Brix% of rice and converts the reading to rice moisture level, so it generally gives a stable reading for white, murky samples. The "G-50" model successfully showed consistent readings for Mr. Terada's broth, and he implemented the unit for his stores. Why do you use Brix meters? We didn't really need it when it was just one location, but when we branched out to multiple locations, it became necessary. It is difficult to train others to recreate the same taste. How many people are in charge of making the broth? At our Abiko store, about 7 to 8 people. Even when I'm not at the store, they can call me and describe the color and the Brix level, and I can give them directions. When I'm in charge of the broth myself, I've began to be able to guess its Brix range. I believe this is possible because being conscious of the Brix scale gave me a reference point for consistency. At what stage do you take measurements? We measure the Brix at the final stage of boiling down the broth. 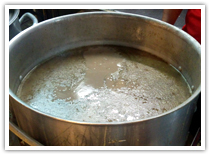 We get it to about 10-11% and freeze it, and the next day we add it to the broth from the day before. We also take measurements when there is a high possibility of fluctuation, such as when we open, when a staff ends his/her shifts, or when we use a broth prepared on a different day. What do you find important in running a ramen shop? Flavors change with even the smallest factors. Each of our branch stores has their own signature taste. No two ingredients are the same, and surrounding temperature and humidity change each day, so it is very challenging to keep recreating the same taste, even within the same branch store. That is why we keep trying hard all the more. We also have variety of choices of noodle firmness, amount of fat, and flavor intensity to satisfy each customer's preference. Ramen with generous amount of pork fat. Their signature Char Siu is so big that it protrudes from the bowl. For the first bowl they serve thick noodles, and skinny noodles are served for seconds. The taste is addictive and unforgettable! We really enjoyed their specialty ramen. They clearly are very passionate about the quality of their products, and we hope that everyone will have a chance to visit them. The taste of Tosakko ramen was something unique to that store. Because it is impossible to recreate their flavor, we came up with a unique one of our own. 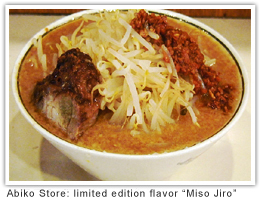 Mito store specializes in miso ramen, considering the trend in the neighborhood. 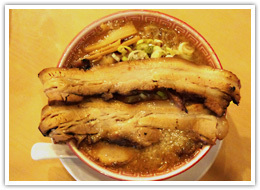 Our neighborhood of the Abiko store is a high-competition area for restaurants, with many popular franchise restaurants as well as numerous ramen shops. If we are to be successful in multiple locations, we need to make each one the most popular one in the neighborhood. Brix meters are essential to maintain our flavor.